I completely forgot to talk about this. I guess I sort of talked about it as a WIP, but I forgot to say that I finished it. I think it's really interesting how the center starts out dark and gets lighter as you move out. I'm guessing that's because of the rows getting longer and not the yarn itself - more time for the pops of color to pool together. The pattern was really nice to knit, very meditative. It's definitely not something to do if you wanted to knit quickly - the cabled drop stitches required a lot of patience and the beaded bind off took multiple sittings to finish. But it's great for if you just want to sit and relax and knit (and watch video podcasts). After knitting this I really want more shawls. 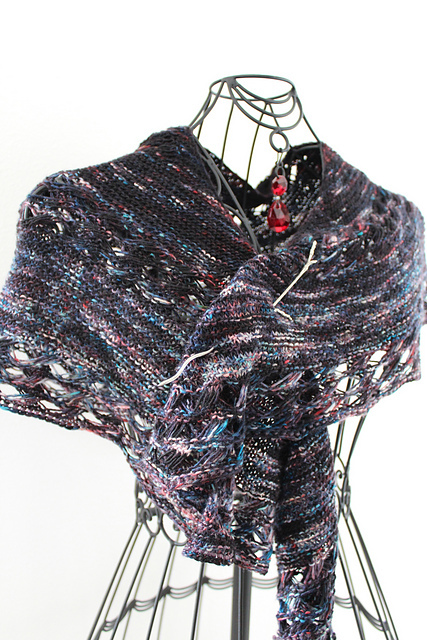 I've since cast on two other shawls (Gingko crescent and Saroyan) and I want to cast on more. Like KNIT ALL THE SHAWLS more.